Graphic Design College is the best way to get the background you need to work in the film industry editing video. James Bond was, is and always will be my idol. Ever since I saw my first Bond film (Licence to Kill) at the age of 9, way back in the summer of 1990, I was instantly hooked. My good friend Paul and I would dress up like characters from Bond films (we'd take turns donning a Blofeld bald cap that I bought at a hobby shop), use a deck of cards to pretend we were playing casino games, and watch all of the Bond films religiously. After being initially disappointed by the 1967 Bond spoof Casino Royale (though my opinion would change drastically over time), I wished they would film a serious version more closely following Ian Fleming's novel. Well, many years after I outgrew pretending to be a secret agent, the Bond producers finally got the rights to the film and made it happen. Casino Royale, which is based on Ian Fleming's first Bond novel from 1953, features James Bond (Daniel Craig's debut as Bond) on his first mission. He is ordered by M (Judi Dench), head of MI6 to travel to Montenegro to make sure that an enemy loses at the high stakes poker game. The enemy in question, Le Chiffre (Mads Mikkelsen), needs to win the money to continue funding terrorists. Bond is aided by CIA man Felix Leiter (Jeffrey Wright), Rene Mathis (Giancarlo Giannini) and the mysterious Vesper Lynd (Eva Green). Though Bond soon learns what terrible things will happen if he doesn't let Le Chiffre win. Over the years, Bond has been shown at many casinos playing many different games - baccarat, roulette, craps, etc but none have been as life threatening as his turn at the poker table in Casino Royale. 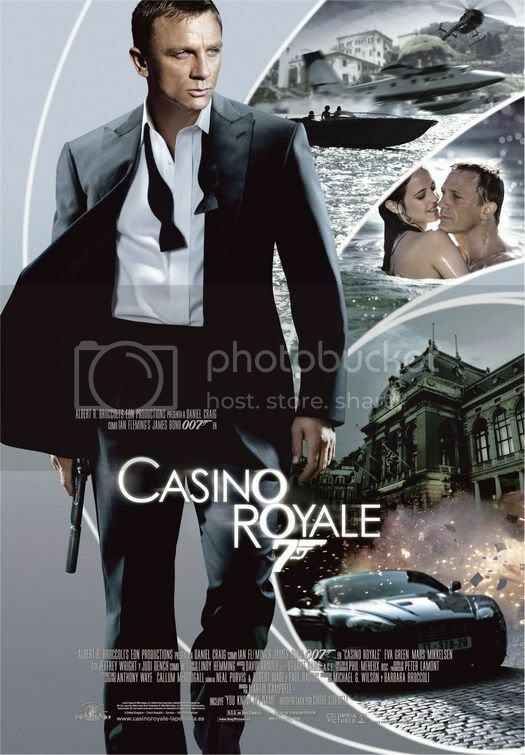 Taking place largely in the casino, this film succeeds in drama, action, suspense and romance, creating one of the best film in the Bond series. Everyone has their favorite Bond (most say Sean Connery) and everyone has their favorite Bond film. Most would argue between From Russia With Love, Goldfinger, On Her Majesty's Secret Service and The Spy Who Loved Me (mine is Dr. No). Casino Royale, and Daniel Craig, easily compete with the best Bond actors and best Bond films of the series. The action is non-stop and Craig is amazing at fighting, acting, romancing and running fast too. The rest of the cast also shines, especially Mads Mikkelson's sadistic Le Chiffre (who seems as if he's almost channeling Peter Lorre's portrayal in the original 1954 American TV movie of Casino Royale). Eva Green, one of the most beautiful and talented Bond girls harkens back to the beauty's of the sixties Bond films like Ursula Andress, Claudine Auger and Daniela Bianchi. Though Bond's next adventure (Quantum of Solace) was a slight misstep in the series, we can thank the Gods that Craig will be back as Bond in Skyfall, coming later this year!